We researched over 60 products, spent more than 20 hours of research, and 6 weeks taking bubble baths to determine that Dolphin Organics bubble bath is the best bubble bath in the category. While many people believe large bubbles are the most important thing to look for in a bubble bath, our research revealed that safety is the number one consideration. Bubbles are important of course, but safety comes first! We tested bubble baths from seven different major manufacturers, giving my kids dozens of bubble baths, while researching what pediatricians, child safety experts from independent testing labs, as well as experts from the Environmental Working Group and Good Guide had to say. After all that, Dolphin Organics came out on top. In our best shampoo guide, we spoke to experts at the Environmental Working Group (EWG) and GoodGuide to learn more about how products are rated for safety. The same theories apply for bubble bath and we’ve determined again that safety is critical so we’re looking for the best product to be one that isn’t harmful to baby. For each product we tested, we searched both group’s databases. Before a product could move to the testing phase, it had to pass the safety-rating test. Then I took the top seven contenders and tested them on my 5 year old daughter. After all of that, I was able to determine that Dolphin Organics is the best pick for most babies and kids. Since we’re talking about babies and baths, we need to insert a quick—but important—reminder to new parents: never, ever, leave a baby in the tub alone. Not even in an inch or two of water. Even if they can sit up and play in the bath, they aren’t yet old enough to be left alone—for any amount of time. A bubble bath can give you some hands-free time if your baby can sit by himself, but you need to be within arms reach, just in case. Let’s just state upfront that newborns, babies, toddlers—heck even adults—don’t need a bubble bath. Well, I’d argue that a mom of a newborn might need a bubble bath, and a good book, but that’s another article. We understand that bubble baths are fun, but aren’t necessary. However, we know that most parents want to see the delight in their baby’s face as he or she is mesmerized with the bubbles. Who wouldn’t? Plus, there’s no better entertainment in the tub than a good old-fashioned bubble bath—it’s better than any toy. A bubble bath product is for parents who want to make bath time extra fun every now and then. Our pick is safe for babies, so we’ll leave it up to you to decide when your baby is old enough for a bubble bath. How Safe is Bubble Bath? When considering safety for your child’s bubble bath there are two main considerations: does the product contain harmful chemicals, and what is the possibility of the bubble bath leading to a urinary tract infection (UTI). Let’s review what we know about UTIs first. If you research how often a baby can take a bubble bath you’ll be hard-pressed to find anyone who says an age under 3 years old, and even then the recommendation usually comes with warnings that bubble baths are not necessary, and may lead to a UTI. We found that experts at Parents.com, The Baby Center, DrSears.com, and the Mayo Clinic, among others, all state that bubble baths may cause UTIs. The general consensus is no bubble baths until age three, and even then proceed with caution. The experts from Parents.com say, “if you do decide to draw your baby a bubble bath, choose one that’s fragrance-free and formulated specifically for infants, which may be less irritating.” We took this advice to heart and chose a fragrance-free product. We feel it’s important for you to know these facts as you decide how often to indulge in a bubble bath for your baby or child. We’ve armed you with a lot of information so you can make an appropriate decision about what’s best for your baby or child in terms of how and when you give them bubble baths. So let’s get to the bubbles. What Makes A Good Bubble Bath? It’s hard to believe, but even bubble baths have come a long way from the days when you used to foam up in the tub. We’re used to just throwing some Mr. Bubble in the bath and watching the bubbles foam up and cover the entire tub. And if you’re like me, you probably even have an iconic childhood bathtub photo of bubbles soaped up on top of your head. Times have changed; today there’s more to consider than just the bubbles when picking the best bubble bath for your baby. We now know about chemicals and how they can have long lasting effects. The concern surrounding chemicals in bubble bath (as with shampoos and other products) is about the long-term effects and how the chemical exposure, over time, might negatively affect your child as he or she grows. The experts we researched and talked to agree that your baby’s health is the No. 1 thing parents should consider when choosing any type of product. With that, we put safety at the top of our criteria and looked for products free of harmful chemicals, added perfumes, and unnecessary dyes. It’s not that we’re against chemicals—everything is, after all, some sort of chemical!—but we lean toward products that are as gentle and known-safe as we can find. Nneka Leiba, the EWG’s deputy director of research cautions parents to be aware of exposures to endocrine or hormone disrupting chemicals (like parabens and phthalates) for babies. “Hormones guide a lot of the growth and development processes in our body. Anything that disrupts growth is a problem,” Leiba explained. Babies are more susceptible to these chemicals because they are growing. “Children are not little adults. Pound for pound, kids are exposed to more contaminants in air, water, food, and personal-care products than adults. Immature organ systems are often less capable of fending off chemical assaults. Subtle damage to developing bodies may lead to disease later in life,” according to the EWG’s top tips for safer products. That’s safety. For a bubble bath to be considered “great,” we believe—and reviews show that most parents agree—it should make super, big, fluffy bubbles that are thick enough to pick up with your hands and play with. We’re talking big enough bubbles that can cover you up and fill the tub. And, the bubbles should last the length of bathtime. If you haven’t bought a bubble bath in a long time, you might think the ones on our list are expensive, but they are all comparable—so much so that cost didn’t really play a big part in our final decision. Most all of the products that we tested are in the same cost range. After you get over the shock that you can’t expect to pay $3 for a bottle of bubble bath, you’ll come to realize the price is worth it because all the products on our final list have excellent safety ratings. Plus, most people don’t give their kids a bubble bath every night. As you only need 1-2 capfuls of liquid for each bath, one bottle will last a long time. In our research, we found that the baseline cost-of-entry to get a high quality, safe bubble bath was an average of about $15 for a 12 oz. bottle. Most that were less didn’t provide the safety rankings we deemed critical. Over $15-18, though, all you were getting was a fancy-sounding product. This next part, scent, is tricky because fragrance is a chemical experts agree to stay away from. Our noses can do a lot of deception in this category so we’re looking for a product that is fragrance-free, but that still has a pleasant smell. Many products use natural oils as scents that could be a good compromise in this category, but our preference is for a product that is completely fragrance-free. One of the other important factors of a good bubble bath is one that doesn’t irritate your baby’s skin, or leave it dry. The purpose of a bath is to have fun, but to also come out feeling soft, and clean. Our pick is hypoallergenic. For the purposes of this guide we chose a product that is best for any skin type. Ease of purchase is great, but we’re not deeming this a necessity since this is all about what’s the best. We’d like our pick to be available in many stores you normally shop, and easily available online. We’re so glad to have easy access to the organizations that we previously mentioned EWG, and GoodGuide, that study, research, and rate bubble baths. Both have specific criteria, although different, for rating the safety of products, and both include a specific category just for bubble baths. Ingredients in bubble baths are similar to those found in shampoos and body washes so our research regarding chemicals is similar to our other guides in these categories. In general, there are between four and seven soap ingredients that should raise parents’ eyebrows. The EWG flags four: fragrance, parabens, PEGs, and ingredients ending in “–eths,” according to Leiba of the EWG. The GoodGuide’s Chief Scientist, Bill Pease says, “we don’t generally advise consumers to try to shop in a way that avoids specific chemicals, because there are so many chemicals in most products, and many pose some level of low or moderate human health risk.” Good Guide advises shopping with broader selection criteria—see the website’s The Best Baby Bubble Bath Products—where they rate bubble baths using a score that integrates health, environmental, and social concerns. Still others list more ingredients to avoid, including the Campaign for Safe Cosmetics, a coalition of public health, educational, and consumer groups, working to eliminate chemicals linked to cancer (and other adverse health concerns) in personal care products. It says consumers should read labels and provides a complete list of “chemicals of concern,” while Dr.Greene.com lists five ingredients to avoid in baby bath and body products: fragrance (parfum), Sodium lauryl and laureth sulfate (SLES) and (SLS), parabens, triclosan [antibacterial agent], and methylisothiazolinone. Like the shampoo research we did, we learned that most liquid soaps contain sodium lauryl sulfate in order to lather. And, since we’re looking for big, thick bubbles we wondered if the products without this chemical would fizzle out. We were pleasantly surprised to find the safest bubble baths still produced big bubbles during testing. After the initial research, we looked up and compared each bubble bath on the EWG and GoodGuide lists. What will throw a bubble bath into the great category is one that gets a zero from the EWG, or a 10 in the health category from GoodGuide. These are the best scores. Bubble baths that ranked 2 or higher on the EWG were crossed off the list. From there we reviewed our notes again and chose the top from the ones that were ranked the best for safety, these six were requested from manufactures and moved on to the testing phase. First was a handwashing test with all 6 contenders and Mr. Bubble. My 5-year-old daughter and I washed our hands with each product, one at a time, and made notes about scent, and packaging (such as “is the bottle hard to open?”). At this point we were smelling the bubble baths to determine if there was a scent we couldn’t live with. Many products in the safe categories smell bad, but we were lucky that all passed the smell test and many didn’t have a scent at all. We decided to move all of them to the bathtub test. I wish I could say this was a tough assignment, but it was a lot of fun. “Hey kids, time to take a bubble bath!” While in the bath, we observed the bubbles. How big were they? Were they thick? Thin? Could you pick them up in your hand? How long did they last? Were they fun to play with? Here’s one shocking discovery: Mr. Bubble didn’t bubble as much as the others on our list! I anticipated the bubble bath products that were deemed safer that because they don’t contain chemicals wouldn’t be able to bubble as much, but they were even better than our old stand-by Mr. Bubble. Not only that, but the Mr. Bubble bubbles didn’t last as long as the products we were testing. After the bath we observed our skin to see if it was irritated or dry. What I know for sure is this was a tough decision. All of the bubble baths we tested worked very well—better than anticipated (which is why we do such thorough testing). But after 6 weeks of testing and taking a what feels like a million bubble baths, I’m confident to report that Dolphin Organics is the one to buy. It produces big, thick bubbles, is fragrance free, received excellent safety reviews, and garnered positive reviews from users. First, it’s safe—the criterion we’ve determined is absolutely critical in a bubble bath. Half of the 14 ingredients are certified organic, while the other ingredients are listed on the label as being “natural.” While we are cautious about the use of the word natural, we’re confident in this product’s EWG rating of one. Only one product we tested received a zero, and it was disqualified for the use of fragrance. And, we love the “Dolphin Dictionary” on the Dolphin Organics website that details ingredients the company uses in all of its products. Unlike some fragrance-free products, Dolphin Organics really doesn’t have a scent at all. Many other products (in the bubble bath and other categories The Nightlight has tested) that are “unscented” or “fragrance free” still have a scent of some kind. Our experience proves, that oftentimes, that scent is unappealing. But in this case, the Dolphin Organics bubble bath is completely scent free. There is no bad odor, no fluffy floral scent, or even a trace of any scent. It truly is fragrance-free. As far as the bubbles go, Dolphin Organics is a winner. It provides enough bubbles to fill the entire tub with just two squirts of liquid. And I’m talking about the kind of bubbles you are familiar with as a kid. I have to admit that during the testing phase I was quite surprised at how good the bubbles were. Because Dolphin Organics doesn’t use the chemicals commonly used to create lather and bubbles, I anticipated very little bubbles. I was pleasantly surprised with the huge tub of bubbles! They were easily 2-3 inches high on average, and up to 5 inches high in some spots, and the bubbles covered the entire surface area of water in the tub. And the bubbles lasted more than the 30 minute tub time we did for each test. At the end of the bath, when the water drained, bubbles lingered in the tub. An added bonus is the fact that this product is tear free. Although you never anticipate getting bubbles in your baby’s eyes, you don’t really have to worry with this product. Other added bonuses that took Dolphin Organics over the top: it’s hypoallergenic and gluten-free, and is PETA certified cruelty-free and vegan. (Does gluten-free matter in a bath soap? Not that we can imagine, but it doesn’t hurt.) The price is right, too. At just $13— Dolphin Organics is cheaper than most contenders. On the Dolphin Organics website, a reader posted, “Prior to Dolphin Organics I never used bubble bath on my daughters because I feared the reaction it would cause. 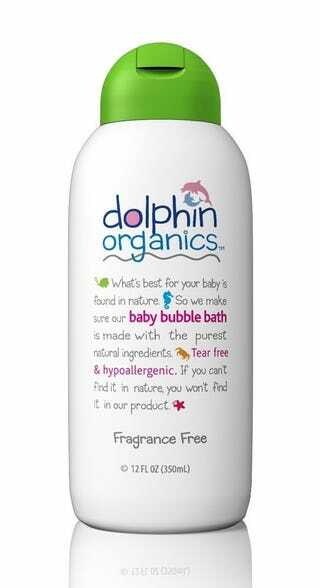 We love Dolphin Organics bubble bath! It is very concentrated so you only need to put a little in the tub. Didn’t realize that the first time we used the bubble bath and bubbles were everywhere. Our daughters love splashing the bubbles around during bath time. We love how the girls smell natural after their bath. If you really want to use a great bubble bath with big bubbles, and a fresh scent, we really love Babo Botanical Lavender Meadowsweet 3 in 1 Bubble Bath Shampoo Wash, which is available for around $13. It has a safety rating of one (zero is the best) from EWG, and an 8 (10 is the best) for health from Good Guide. The bubble-making power of Babo Botanicals is stellar. It created a bathtub full of big, thick bubbles. And we loved the fact that we didn’t need to use a separate shampoo on the nights we tested this bubble bath. Just soak up the bubbles in the tub, wash up and you’re done! As a busy mom I love this added bonus. The only reason this is not our pick is because it’s scented. The floral scent is mild, yet fragrant. It reminds me of an aromatherapy session. Personally, I love the smell, but wonder if it’s best for everyone. When our bathtub time was over, and I returned to the bathroom the entire bathroom smelled wonderful, natural and fresh. While I love it, I can’t be certain everyone will. It’s as good a value as our pick, has a good safety rating, stellar bubbles, and a wonderful fresh scent, and it improves by being a 3-in-1 product that our main pick doesn’t offer. While we ultimately landed on Dolphin Organics for all its great qualities, we’d be remiss if we didn’t acknowledge how good Natures Baby Organics really is. It’s bubble-making ability was excellent and it has a zero rating from the EWG (the only one on our test list with a zero, and a lower score than Our Pick). It’s reasonably priced as well, at around $13 a bottle. The reason it’s not Our Pick is that it has a tangerine scent. Although rated a zero, we couldn’t choose it as Our Pick because of the scent. It’s light and fresh, so if you like mild scents you’ll love this one like we did. If you decide to go with the Natures Baby Organics, we can assure you that you’ll be happy with it. We loved it. We considered these alternatives from manufacturers, but they ranked just below the ones at the top of our list. California Baby Super Sensitive Bubble Bath — This one is good, but Dolphin Organics edged it out. It comes with a wand to blow bubbles, but don’t buy it for that. We couldn’t get it to work, and one Amazon reviewer said the same when she posted, “the solution is too thin to blow bubbles.” It’s still a good choice with great bubbles and no scent. This is a great choice and came close to becoming our pick. Babyganics Bubble Bath, Fragrance Free — It didn’t get as many reviews on Amazon so this could just be a product that not enough people have yet to try. It produces great bubbles and is fragrance free with literally no scent. This is a good alternative. It’s EWG safety rating is a one. Honest — Like the others in this category, it provided lush, big bubbles. It’s fragrance free and worked well in our tests. It also gets a one from the EWG. We also considered these brands, but can’t recommend them. Mr. Bubble—We simply had to test Mr. Bubble because of it’s bubble bath brand recognition, but it didn’t rank well on any of the safety sites to qualify it for a recommendation. However, we did test it because of brand loyalty; it simply didn’t hold up to the competition. Surprisingly, the bubbles were not as big as competitors’, and they didn’t last as long. Baby Magic Calming Baby Bath, Lavender and Chamomile—another common choice, but it didn’t rank well enough in terms of safety. Johnson’s Baby Bedtime Bath—it received a 5 from EWG which put it too high for us to consider for safety reasons. Pampers Kandoo Bubble Bath Unscented—This is a bound to be a popular choice since it’s readily accessible on the shelves of many common shopping stores, but it’s rating on EWG was too high (4) for us to consider for testing. Something important to note in this product category is to pay attention to the directions. Since all the products we tested were rated well for safety it means they don’t contain the normal suds-creating chemicals. If used incorrectly, you might not achieve the same results we did in testing. For each test we utilized the amount of bubble bath solution that it called for on the package (usually about 2 capfuls) and followed the directions; which in most cases are to pour the liquid directly under the running water. Some said to also use your hand to agitate the solution in the water. From the lush bubbles to the great safety rating, plus the way it performed in our testing, it’s clear Dolphin Organics is the bubble bath of choice for now. I’m looking forward to an excuse to take another bubble bath myself! Prevention of Drowning in Infants, Children and Adolescents, American Academy of Pediatrics.